The recent trip of Neturei Karta leaders to Iran has evoked much in the way of hysterical comment in some quarters. The vicious nature of this reaction has puzzled us for some time. Why should an attempt to create goodwill between the Jewish people and the Iranian government in particular, or the Islamic world in general, be viewed as negative effort? If misunderstandings existed in the past, why should we not try to alleviate them in the present? If our efforts have relieved antagonism, shouldn't this be seen as a positive thing for the Jewish people and all men? If we are indeed concerned about the future of our relations with the Islamic world, then shouldn't all efforts be made to assure that those relations be pleasant? For those who took time to bypass the media blizzard of disinformation, several things about our trip should have been clear. Our position as stated throughout the conference was explicit and free of any ambiguity. We affirmed the reality of the mass murder of Jews during the Second World War. And we were not the only speakers there who did so. But (also of enormous significance) we told those assembled that the reality of the Holocaust should not be used as a pretext to strip the Palestinian people, either as individuals or collectively, of their property and land. It is our Torah based obligation to constantly declare before all humanity that the deeds done to the Palestinian people throughout the last century and continuing to this day are unconscionable. Our experience has shown that the fulfillment of this obligation yields only positive results. Further, it is our assumption that the approach of Zionism has not lessened the Jewish-Gentile antagonism but has exacerbated it.Â The trail of suffering created by this movement stretches back over the decades and continues to the present. These tragedies should come as no surprise to anyone since the Torah expressly forbids the desire or the implementation of any Jewish sovereignty over the Holy Land. We ask that the interested reader take the time to read the texts of the actual talks given in Tehran. Our beliefs were confirmed when the Iranian President Dr. Mahmoud Ahmadinejad, at our meeting with him after the December Conference, condemned anti-Semitism in no uncertain terms. He stated (and his words were carried by the Iranian news agency IRNAJ) that "vigilant and just human beings will not blame the Jews for the crimes committed by the fake Zionist regime and its supporters in the occupied territories, including genocide of defenseless and oppressed women and children." 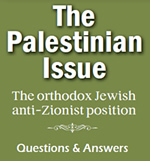 And, in contrast to the stereotype perpetrated by the would-be mind controllers of the media, the President's solution to the conflict in the Holy Land was to suggest that "a free referendum to establish a government based on the will of the Palestinian nation in which all Palestinians, including Jews, Christians and Muslims will be given the chance to vote." Obviously two paths lie before the Jewish people. There is the path of Zionism that summons Jews to a state of perpetual war in order to "protect" Jewry and there is the path of the Torah which calls upon us to seek peace and dialogue with all men.To us the choice is elementary.